No privacy for anyone anywhere! Our protagonist (though not necessarily a hero) is young 20-something Mae Holland, fresh out of college and highly impressionable. Mae's best friend Annie hooks her up with a job as a customer service rep (or as the Circle calls it, Customer Experience) to serve advertisers who use the Circle to market their brands. As days and weeks go by, Mae gets bought into the Circle's mission of gaining power to obtain everyone's personal information, and making it fully available and transparent for all to see. For fear of being canned from the Circle (or maybe because she's literally a follower and can't make logical choices of her own), Mae eventually turns on her family and friends to support the Circle's end game. She spends all her time on the Internet "liking" and "smiling" social media posts, and sending basic replies to strangers with whom she feels she's made a connection. However, Mae lacks a real connection with anyone, save a mysterious man named Kalden who seems to magically appear and disappear at random times on campus, managing to steal Mae's heart in the process. After facing many trials and tribulations making her way to the top of the Circle food chain, Mae is forced to make a big final decision that could severely impact the country's democracy. The Circle reminded me of about five different Black Mirror episodes. Some concepts in this novel reminded me of George Orwell's 1984, such as "everybody's watching, all the time!" Mae could be the most pathetic protagonist I've ever known. From the get-go, her character lacked self-esteem, self-confidence, and overall self-worth. I felt embarrassed just reading about her squirming in front of peers and co-workers when asked to do certain things. I found myself shaking my head and doing the face-in-palm thing several times while reading this book. I actually really loved this book. I loved everything it stood for. 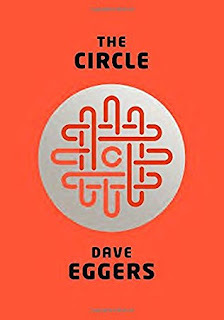 I loved how Eggers turned the concept of social media and the Internet "running the world" into somewhat of a black comedy. I loved how it made fun of all the people in our society constantly glued to their phones, chronicling every second of their lives on social media, and lacking normal social functionality. Ain't nobody got time for that when they're trying to enjoy real life! Dave Eggers has also written A Heartbreaking Work of Staggering Genius, The Wild Things, and Heroes of the Frontier.